"A high-flying debut... Fortier navigates around false clues and twists, resulting in a… love story that reads like a Da Vinci Code for the smart modern woman." "Juliet is one of those rare novels that has it all: lush prose, tightly intertwined parallel narratives, intrigue, and historical detail all set against a backdrop of looming danger. Anne Fortier casts a new light on one of history's greatest stories of passion. I was swept away." "Ingenious, intriguing, a thrilling story that keeps you turning the pages. This is a wonderfully textured novel of history and imagination that brings Italy, past and present, beautifully to life." "This book is a stunner. Elegantly written in exquisite, vibrant and witty prose that rides well with the clever use of quotes from Shakespeare, it interweaves an astonishing historic take on the tale of the star-crossed lovers with a fast-paced, modern thriller. Every sentence is a joy, every character lives, and medieval and modern Siena are brilliantly evoked. The theme is delightfully original - and the kind of thing you wish you had thought up yourself. The author is to be congratulated on a truly fabulous book that will surely be a resounding success! We will never see Romeo and Juliet in quite the same way again..."
"A feast of myth, history, and tantalizing indulgences—I was swept away, blown away, and taken for ransom. Anne Fortier breathes new life into the Shakespearean tragedy we thought we knew. I fell in love with Juliet all over again." "Anne Fortier delivers a rollicking quest through the dark alleyways and shimmering hill towns that once inspired Shakespeare's great love story. This book has everything: Juliet and Romeo; the Italian nobility and the mafia underworld; swashbuckling heroes and spunky heroines; secret documents and hidden treasures; passionate loves and violent vendettas that span the centuries. Juliet is a thrilling debut novel, completely saturated in fascinating history." "Spinning backward and forward from Shakespeare's immortal play, Anne Fortier puts to delicious use all the familiar Romantic motifs alternating with complex contemporary intrigue to weave a multi-layered cloth of stories within stories, where fortunes turn in an instant and every character is a shape shifter. Boldly imagined, brilliantly plotted, beautifully described, Juliet will carry you spellbound until the gripping end. An astonishing achievement." "In her debut novel, Anne Fortier takes a great idea—a young woman discovers she is the descendant of the Juliet who inspired Shakespeare's play—and executes it thrillingly. 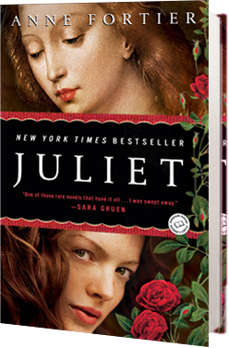 Juliet has it all—history, mystery, and romance. Ms. Fortier handles the dual plot lines with mastery, beautifully rendering Siena of the past and present."